In November 2015 Dubheart were invited to take part in a brand new BBC TV show called 'UK's best part time band'. The show focuses on the life of hard working bands in the UK. 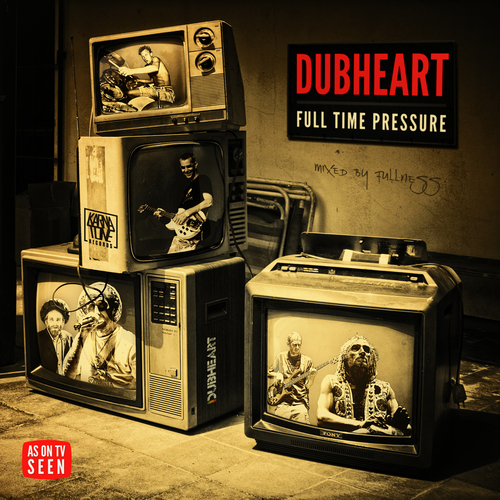 Each time the band performed they were required to play a cover track alongside an original, the band enjoyed playing them so much in the set they decided to record them, and along with a selection of various Fullness dub cuts it became the EP 'Full Time Pressure'. This is Dubheart's representation of four classic tracks from pop and reggae history. *Good thing going – first recorded by Michael Jackson for Barry Gordy, and made even more popular by Sugar Minot. *Blood Dunza – Reggae sound system foundation tune, sung by Johnny Clarke for dub reggae originator King Tubby. *A Hard Days night – Classic Beatles, this version based on 70’s reggae cover by Pat Kelly. *Music is my desire – Original track recorded by Pablo Moses. *All the dub versions mixed live by Fullness. "4 classics that have inspired Dubheart, and here perfectly reinterpreted." "Albums of times, there are many, but few possess Dub versions of the quality of those proposed on "Full Time Pressure". For each title, Fullness offers 2 different cuts, a first classic with snippets of voices of Tenja, and the second more deconstructed and effects-packed! Dubwise!"